Nowadays, there is a much greater awareness of the need for safety in the workplace. The prevalence of information made possible by the Internet, combined with a greater focus on the wellbeing of employees has inspired a shift toward better practices to make life at work a much safer reality. Also, with many companies counting the cost of expensive lawsuits, which could have been avoided by putting appropriate safeguards in place, now is the time to take action and insulate your business against the possibility of accidents happening that could threaten the future of your venture. 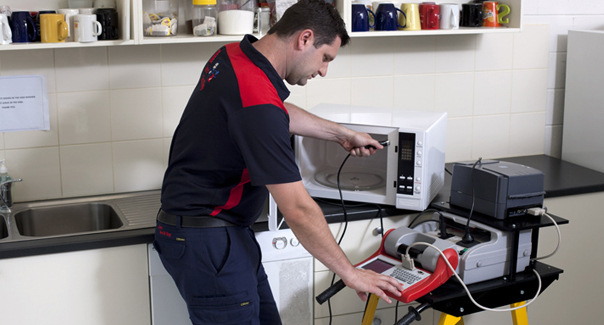 Electrical appliance testing in Perth is something that the team here at Jim’s Test and Tag do better than anyone else. For over a decade our technicians have visited thousands of business premises to thoroughly inspect and ensure that their electrical equipment and appliances are in fine working condition and protected against the possibility of faulting or malfunctioning. Hundreds of lives are saved every single year as a result of this simple but vital safety check, which simultaneously ensures that business owners can feel confident that they are fully compliant with the prevailing laws, and that the risk of their workers being harmed while at work is reduced considerably. Here at Jim’s Test and Tag, we have visited countless workplaces with overloaded circuits and poor wiring. The problem here is that this can lead to a fire and where subpar safety procedures are in place, or if risk assessments have not been carried out for a while, then the likelihood of an accident happening is therefore increased. Our test and tag service affords Perth facilities managers to gain a comprehensive overview of the current risk level to their business. Exposed electrical parts, as well as damaged equipment, which may not have caused a problem so far, including temporary lighting, an absence of insulation on electrical cords as well as unprotected power distribution units, can lead to burns and shocks. Furthermore, if your workplace is considered a hostile operating environment, that is one where the electrical equipment is likely to become damaged as a result of the conditions, then it is imperative that you have an appropriate testing and tagging program in place to ensure compliance with all law and regulations. Comprehensive electrical appliance testing in Perth safeguards your employees’ wellbeing and creates a better working environment that affords you peace of mind and enables you to get on with focusing on what you do best. Here at Jim’s Test and Tag, we believe that prevention is the number one priority for any business. So, get in touch with us today we will give you a quote free of charge and set you on a path toward a much safer future. Proper testing and tagging of your electrical equipment not only ensures that you protect yourself and others in your workplace; it also ensures your compliance with current safety standards. This is why you need a service provider that can test and tag your electrical equipment in Perth with the pertinent information needed to get you up to regulation. We know how important safety is to you and your staff. Eliminate risk with regular testing and reduce the chances of damaging your property. Regular inspections ensure your equipment and appliances are safe for use. Don’t expose your business to unnecessary harm – test and tag your building today. Our technicians offer a range of electrical and fire safety testing services. Take a look at the following services and get in touch for a free quote today. You can meet all your safety obligations with one team when you work with Jim’s Test & Tag. Our ongoing support and thorough services are available across Perth. Contact us today and we can travel to your suburb and complete all of your safety testing requirements. Why should I choose Jim’s Test & Tag for my safety testing needs? Our test and tag Perth team members are dedicated to providing ongoing safety testing services to businesses across the city. We have a data management system in place that allows us to keep track of your testing results and notify you when your next test is due. You will receive a detailed test report for each appliance we inspect. You can also request notification of scheduled maintenance so that you never miss a compliance test. We offer fire safety testing services as well as electrical testing and tagging. Our team members can maintain your fire extinguishers, fire hose reels, and fire blankets. We can check the accessibility of each device and check for any damage. We refill fire extinguishers with a range of extinguishing agents and can recommend the right extinguisher for your environment. All of our tests will be accompanied by a fire safety report. Contact us today to get started with a thorough consultation on what services your business needs. With Jim’s Test & tag Perth, we’ve always got you covered.